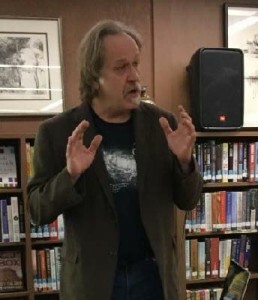 Press Release posted 2/2/17 – JPL: Powered by STEAM!, a program by Dr. Steve Cornford, started February’s One Book, One City events with a tour of the universe and its splendor at the Sierra Madre Public Library on February 1. Dr. Cornford, shared gorgeous images of planets, stars, and solar systems that are the “Art” part of STEAM (Science, Technology, Engineering, Art & Math). Cornford is with the Strategic Systems Office at NASA/JPL/Caltech, has been part of the conception, design, building and testing of spacecraft and their components. Rise of the Rocket Girls: The Women Who Propelled Us, from Missiles to the Moon to Mars by Nathalia Holt is this year’s choice for the One Book One City Program sponsored by the Library in February 2017. Thursday, Feb. 16, at 11:00 am – Third Thursday Book Club – Rise of the Rocket Girls at Library. Thursday, Feb. 16, at 4:00-5:00 pm, Community Recreation Center. – STEAM Club. Discovery Dome Planetarium for Children! Spend an hour learning about space. Registration is required and space is limited. Thursday, Feb. 16, at 5:00-6:00 pm, Community Recreation Center. – Discovery Dome Planetarium for Adults! Take a journey through the universe. Saturday, Feb. 18 at 3:00 pm Saturday Afternoon Movie – Iron Giant, at the Library. Saturday, Feb. 25, at 7:00 pm Nathalia Holt, in the Sierra Madre Elementary School Auditorium. Vromans’ will bring books to sell and sign. Nathalia Holt, author of Rise of the Rocket Girls, is a science writer and author of Cured: The People who Defeated HIV. Her work has appeared in The New York Times, The Los Angeles Times, The Atlantic, Slate, Popular Science, and Time Magazine. One Book, One City is a community reading program that invites everyone to read and discuss the same book during a month of exciting free programs.